Venus Rises is back. Almost. Exordium Part 2 is currently up on Indiegogo. Unfortunately some technical issues prevented me from getting this review up sooner, but there’s still a few days left in their campaign. I’m going to start at the end of this issue. 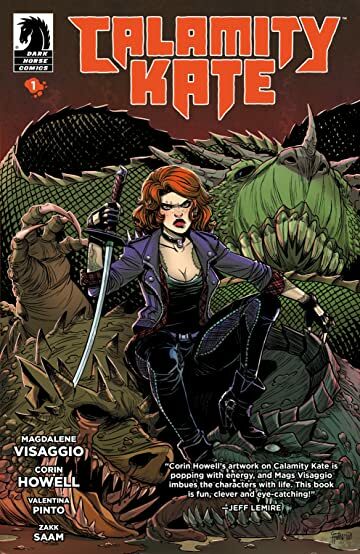 Writer/Co-Creator Magdalene Visaggio give a personal look at how Calamity Kate come from her need for “creative self-destruction.” I’m torn between wishing that missive had opened the book, and loving that it was at the end because it drastically changes how I looked at the rest of the story. This is the story of Kate Strand, redefining herself. Recently divorced, she heads west and shows up on the doorstep of her former roommate, and best friend, in L.A. The story is a poignant look at rebuilding a life from the ruins of abandoned bridges of the past. Oh, and monster killing.